(Nanowerk News) More than three decades ago, when researchers began exploring photocatalysis as a way to purify water, efforts were buoyed by a wave of optimism within academia. An abundance of research (more than 8,000 research papers since 2000), though, hasn’t yet translated to widespread industry use. To take a closer look at this gap, the Nanotechnology Enabled Water Treatment Systems center (NEWT) organized a workshop to take a hard look at the technology and assess its real-world value. 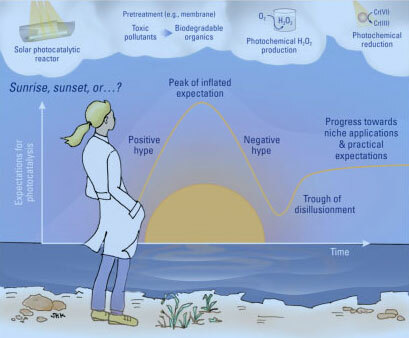 That workshop served as the basis for a paper published in Environmental Science & Technology (ES&T) that explores how to best direct research efforts in this area ("The Technology Horizon for Photocatalytic Water Treatment: Sunrise or Sunset?"). “We recognize the large disparity between academic research and industry application,” said Jaehong Kim, the Henry P. Becton Sr. Professor and Chair of Chemical & Environmental Engineering at Yale. For the workshop, Kim assembled a team of 14 leading researchers in the field from around the world for a daylong brainstorming session last March. They shared their ideas on potential applications of the technology, its limitations, and best real-world uses for it. The researchers focused on photocatalytic advanced oxidation processes (AOPs), which treat water by breaking down contaminants. 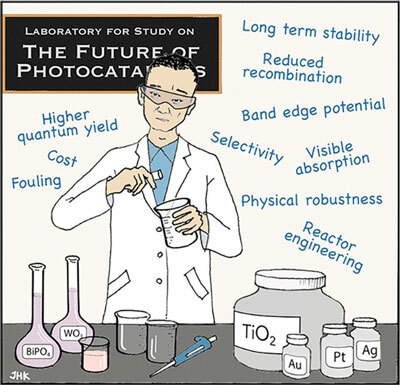 Unlike conventional AOPs, photocatalysis doesn’t require chemicals. And because it requires only low-energy UV light, there are potential solar applications. The standard material for semiconductors is titanium dioxide (TiO2), which is inexpensive and relatively non-toxic. These properties promised a revolutionary new way to treat water. 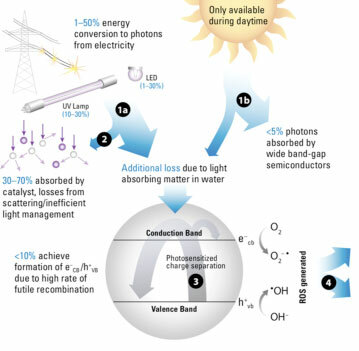 The ES&T paper refers to the early years of photocatalysis research as its “sunrise” phase - that is, when excitement by the subject’s potential fuels a vast body of research. Having gone beyond that phase, Kim says it is now time to take a more measured approach. In recent years, leading researchers have questioned many of the initial claims for photocatalysis, especially regarding large-scale municipal water treatment. Kim stresses that the ES&T paper isn’t meant to discourage researchers about photocatalysis, but to serve as a “reality check” and offer some guidance on possible directions to take it. One issue, Kim said, is that there’s a disconnect between a discovery that’s scientifically interesting compared to something that’s practically useful. “Researchers started to make very fancy nanomaterials for photocatalysis, but a lot of these materials can’t be used for water treatment,” Kim said. That is, they’re too hard to make and too expensive. Also, many of these materials aren’t robust enough for their designated uses - the conditions for an actual water treatment system are very different from those of a lab. The researchers offer suggestions as to how the technology might be best used. Specifically, they point to niche applications, such as hydroponics and aquaculture, which are usually practiced on a small scale. Because it can be solar-powered, the technology could also be potentially used in resource-limited regions that lack energy infrastructures, particularly remote communities with small populations. And because the process doesn’t require consumable chemicals, it also has promise for places where chemicals are hard to get. Pedro J.J. Alvarez, founding director of NEWT, said part of the center’s mission is to take an honest look at the research it’s conducting and discern between “academic hype” and work likely to produce important societal benefits, such as water security. The ES&T paper is part of that effort. "There was a point where we noticed there was not enough ‘pull' from our industrial partners, despite the many high-impact papers we were generating, and decided to investigate this disconnect," said Alvarez, the George R. Brown Professor of Civil and Environmental Engineering at Rice University. Stephanie K. Loeb, first author of the paper, said the project aimed to provide background for researchers and a candid assessment of the existing literature. The research has resonated with the community of photocatalytic researchers. The study, which features the Kim’s artwork (including the issue’s cover), has been on the website’s list of most read papers since it went online. NEWT is an interdisciplinary, multi-institution nanosystems-engineering research center headquartered at Rice University that is applying nanotechnology to develop off-grid water treatment systems that both protect human lives and support sustainable economic development. In addition to Yale and Rice, NEWT’s leadership includes experts from Arizona State University, the University of Texas at El Paso and more than 30 industry and government partners.